Usually I list a couple of my favorite things I've found on Pinterest on Sundays, but this week I'm changing it up. I decided to list some of my favorite blogs. I read a lot of blogs. I use Bloglovin' to keep track of all of the posts and it makes it so easy. I can pick to only reads only certain blogs posts, read them in chronological order, read by each blogs' focus. It's great! So, here are some of my favorites and the links to them. I found Beth's blog, Living a Goddess Life when she was my swap partner for the Local Flavor's swap. She is a lot of fun and we have a similar tastes in a lot of things. Her blog focuses on book reviews, crafty things, beauty tips, music, and just what she likes and what's going on in her life. I always look forward to reading what she has to say because she rights engaging posts and is just so open. I feel like Beth is comfortable in her own skin. She who she is, and she's pretty awesome. 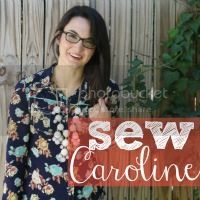 I don't even remember how I found Sew Caroline but I'm so glad I did. She focuses mostly on sewing clothing, but occasionally posts on other things too. She writes high energy and always motivates me to get going on my stash of fabrics and to make cute things. I love her taste in fabrics and sewing patterns. Caroline is great for when you need a little motivation to get a project finished (or started). Flamingo Toes is another blog I've been following for a while. Bev always has the best craft tutorials. She sews, makes jewelry, embroiders. She also hosts an awesome Pinterest feature each week as well as a "Think Pink" link party each week where you can show off your projects. I love her tutorials. She writes clear instructions and makes everything look so easy. Go search her blog if you're looking for some project inspiration. One last sewing blog. 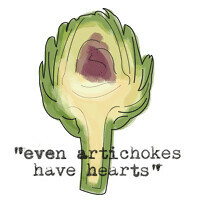 Even Artichokes Have Hearts is ran by English girl, Skye. I found her blog when I saw here tote bag companion pouch featured on a sewing blog. She doesn't post much more than once or twice a week, but she is always working on something cool. She quilts, she cooks, she reads. She's a girl after my own heart. So there you have it, my four picks for blogs that may be new to you, and are worth checking out. Have a great weekend and see you all when I get back from my crafting retreat. Hopefully with lots of finished projects to show off.